Mortars and pestles are tools used in the production of Japanese paintings to grind mud pigments and chalk. They are also used for grinding granular hydrated alum into powder when making sizing solution. 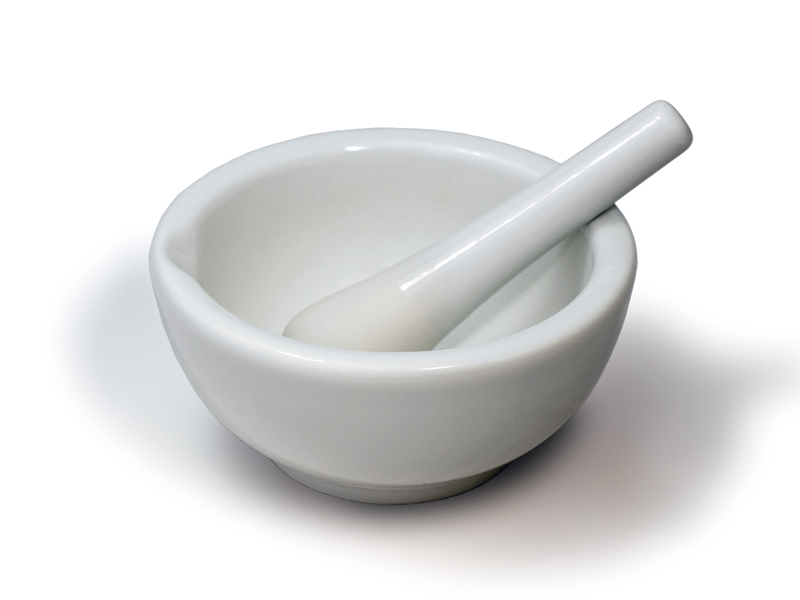 Mortars and pestles are made of white ceramics. The inside of the bowl-shaped mortar and the tip of the club-shaped pestle have a rough surface so that it works better to grind substances. Mortars are available in various sizes such as those with a diameter of 9cm, 12cm and 15cm, and pestles come in matching sizes. Mud pigments and chalk are often sold in blocks and they do not mix well with glue solution as they are. So they need to be ground into fine powder with a mortar and pestle first. This process is called “karazuri” and must be continued until the pigment becomes a smooth, fine powder with a texture similar to cornstarch which sticks to the side of the mortar. 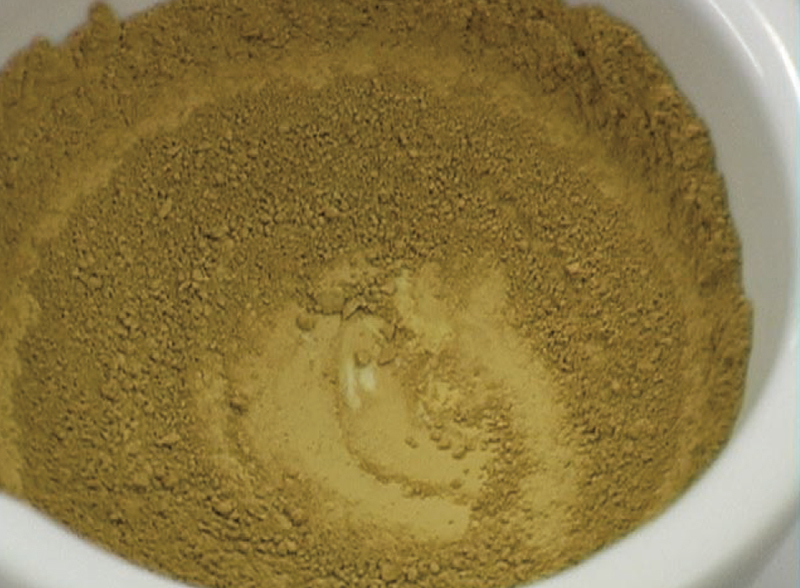 The powdered mud pigment should then be placed in a palette and mixed carefully with glue before water is added. When dissolving large amounts of mud pigment, this may also be done in the mortar. Mortars and pestles should be washed thoroughly with water after use. Stubborn residue may be washed off using a sponge and some dishwashing detergent or by soaking in hot water. Furthermore, the inside of a mortar could become stained by the color of the mud pigment so having two mortars, one for chalk and another for other colors, will help prevent the colors from mixing. Mortars and pestles are sold in sets and can be purchased at art supply stores that handle Japanese painting supplies and other art tools. 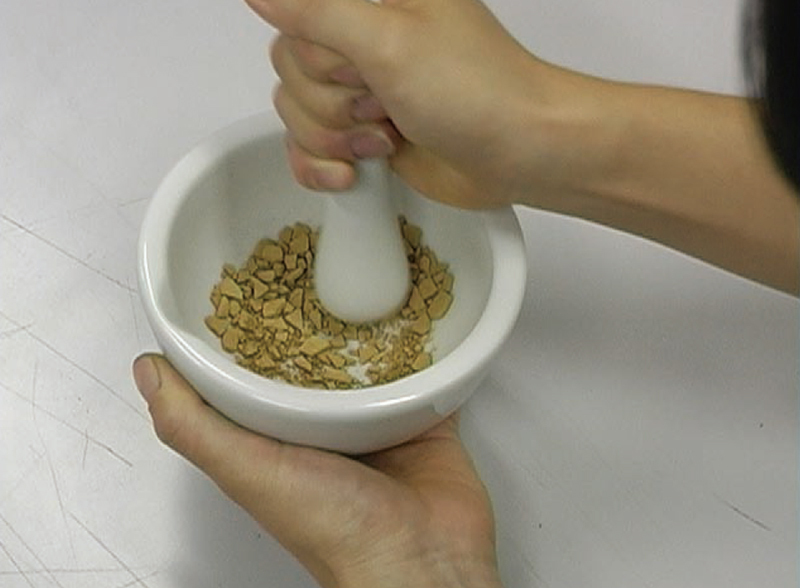 Karazuri Place some mud pigment in a mortar and grind it with a pestle. Grind it well until it becomes fine powder.